The main accesory I wanted to buy with my iPad was the camera connection kit. Unfortunately this was sold out in New York, so I tried again on launch day in the UK. When the kit sold out in a couple of hours here it was time to place an order through the Apple online store and wait three weeks like everyone else. I’ve now had the kit for two weeks and can give some thoughts on it’s use. 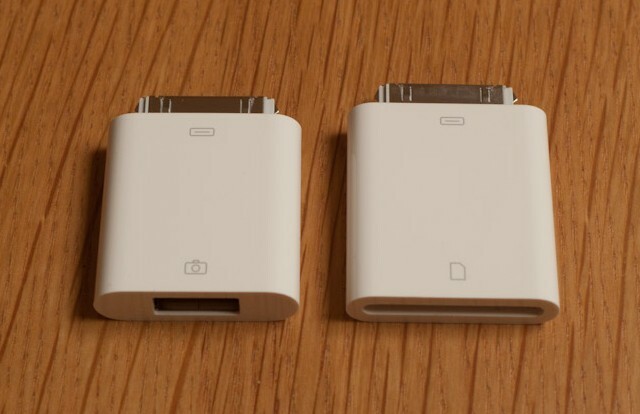 The camera connection kit comprises two small adaptors that plug into the iPad dock connector, providing an SD card slot and a USB socket.